When you download PowerGREP, you not only get the worlds most powerful Windows grep tool. You also get a help file that is more detailed and comprehensive that any other Windows grep software's documentation. Simply press F1 to bring it up while using PowerGREP. The help file explains all of PowerGREP's functionality. On top of that, you get a clearly written step by step tutorial to regular expressions, and a plethora of examples that you can readily apply or adapt for your own purposes. The examples give you a good idea what you can achieve with PowerGREP. If you just want to have a look at the documentation without downloading anything, you can read the PowerGREP user's guide on this website. The examples listed below link to this online user's guide. The regular expressions tutorial has its own website. Quickly search across files, folders and archives on your computer or network. Search for words, phrases or binary data. Or use regular expressions to describe the form of what you're looking for, and let PowerGREP find the actual text. Specify as many search terms as you want. Inspect the context of individual search matches, or group identical matches together. Search and replace through heaps of files without opening them first. Preview the replacements without modifying any files. Make complex replacements or conversions with regular expressions. Replace or revert individual search matches at your leisure. Work safely with flexible backup and undo options. Gather statistics and extract data from files, archives and logs. 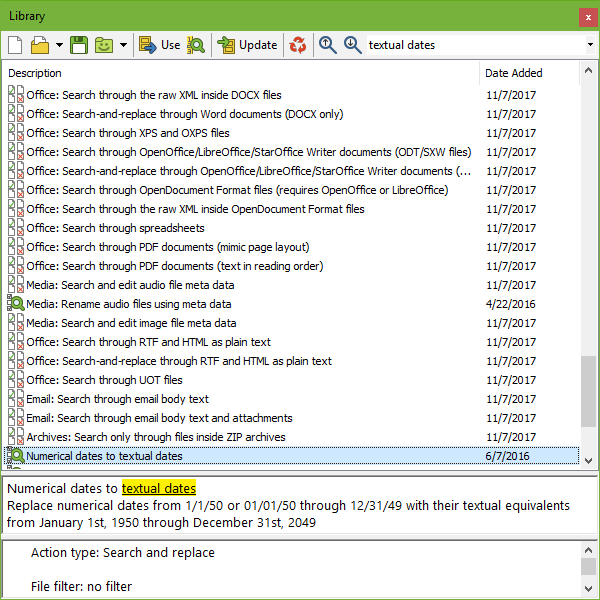 Collect search matches into one or more new files. Use regular expressions to describe the form of the text you want to extract, and let PowerGREP collect all or part of the match. Sort matches, and group identical matches and count them, to produce informative statistics. "PowerGREP is fantastic. As a sysadmin, I don't have a clue how I lived without it. I now use it several times a day to answer questions that use to take much longer to answer. You've made me king of the log data... I'm slicing and dicing like a Ginsu knife." "Yes, I'm even RTFM... up to page 130... and enjoying it." "I must also compliment you on your very helpful manual, especially on the tricky subject of regular expressions. Too often supplied documentation for such things are substandard or badly written, riddled with grammatical errors, etc."